Check out this cool modification of some existing amplifier, as described by Mr. Patrick Jankowiak . He has basically applied the concept of a “negative current feedback”, where the cathode current of the output tubes, which is routed to ground in “typical” designs, here this current is actually “used” before it hits the ground. It is routed through the SECONDARY winding of the output transformer, so as to achieve a certain amount of ‘ties’ with the currents flowing through the secondary. It works like this: The currents flowing through the speakers are simultaneously “modulating” the current that flows from the cathode of the output tube to ground. This implies that the speaker currents create a small “delta” voltage at the cathode of the respective output tube. The phase setup is arranged in such a manner, so as to achieve negative current feedback. Just to remind you: The output tube is controlled not by an ambiguous “grid” voltage, but specifically by the Grid voltage as referred to the CATHODE voltage of the tube, and this may, or may not be at ground potential. Ok, so you have the controlling signal voltage fed into the Grid, but then you have this little feedback voltage, this ‘delta’, which is making corrections from the Cathode side. Considering the secondary winding, the Cathode is “almost” connected to ground, but .. not quite. In terms of DC, it is as good as connected, via the secondary winding, most probably by a fraction of a single Ohm. But in AC terms, this ‘delta’, depending on the specific point, where you “tap into” the secondary, may be significant. Why is Current Feedback “Good” ? Because the output tubes behavior is “corrected” within a fairly short loop, and the correction encompasses any and all misbehavior of the output transformer’s core, but also misbehavior in terms of output CURRENT, and not output VOLTAGE. Please kindly note that I am freaking out lately on the subject of current driven amplifiers, as a general “way to go”. This is a far shot from what we have here, but it always makes my heart happy, when I see that it is the CURRENT behavior that get’s taken “into account” within the corrective actions of the feedback loop. But the downside of a “single negative current feedback” loop is the following: there is (obviously) a DC component of current flowing through the output tube, and this, when flowing through the secondary winding, upsets, to a certain extent, the magnetic field in the transformer core, just as any other “net DC” component of DC current that may be flowing through such a transformer, as it will always tend to saturate the core. The genius of the modification as proposed by Mr. Patrick Jankowiak lies in the fact that he uses this concept not in the context of a single output tube, such as a Single Ended (SE) amp, where you normally see these setups, but Mr. Patrick Jankowiak takes this concept and uses it within the *** PUSH-PULL *** domain, and essentially DOUBLES the concept. In anti-phase. He uses TWO such negative current feedback loops, from BOTH of the output tubes, working in push-pull, anti-phase, and feeds their respective cathode currents into the secondary winding at two different spots, at the same time. On the drawing (the “zoom in” one), check out the traces that I have highlighted. The red trace from one of the output tubes, and the rosa trace from the other output tube, working in anti-phase to the first one. The cathode currents from the output tubes are routed to Ground (the green trace) via an equal amount of turns through two different sections of the secondary wining. Please also note, that these AC+DC currents are also driven through the secondary winding in “anti-phase” to each other. The DC components of these cathode currents, providing that the amp is balanced and the biases are well trimmed, shall effectively null themselves away, due to the antiphase connection. The net DC current component may be reduced to zero, as the currents flow in anti-phase to each other. 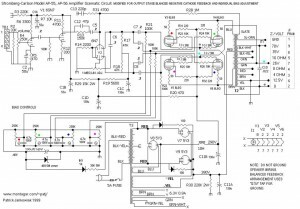 But at the same time, the AC components, which are ALREADY in anti-phase, when routed in an antiphase fashion through those windings, they are IN-PHASE again. They essentially sum up. Now, looking at this from the other side: it is the current that is actually FLOWING through your speakers that is influencing these IN-PHASE cathode currents. Due to the “anti-phase method of connecting the wires from the cathodes to the secondary, each of the cathodes receives a correct phase of the negative current feedback component. ( If it does not work, or oscillates, … simply exchange the wires between the tubes – it is as simple as that ! ). Please note: the Cathode Currents of one of the output tubes flows from the “0″ tap into the “4 ohms” tap. The Cathode Current of the other tube flows from the “16 ohm” tap (*) into the “4 ohm” tap. The whole secondary is grounded at the “4 ohms” tap. (*) please remember that the square root of sixteen results in “4″. Impedances transform as a “square” of the winding ratio. The number of turns between “0″ and “4″ is obviously the same, as the number of turns between “4″ and “16″. Provided that the secondary windings in your amplifier provide you with 4 / 16 ohm taps, it should be possible to apply a similar trick in your setup, and hence – you can actually dive into a scheme of a “symmetrical negative current feedback” and experiment with it. One word of caution though – after applying the NCF concept, you would essentially need some more voltage swing to drive the output stage. This is due to the fact that now you have a bit of negative feedback within the output stage, so it has less voltage gain. So in order to “achieve” the same power you had previously, you would need to “swing the grids” of such a modified output stage with a higher voltage swing. The higher voltage swing may be “forced” by fiddling with the amount of global feedback, but your driver stage “may” or “may not” be capable of physically coping with the delivery of a higher voltage swing. Some extra tweaks may be necessary. Another thing to consider is to recalculate, or “pick” via experimenting, a new value of the serial feedback resistor of the global feedback loop. After applying the modification, you will observe a smaller output power. 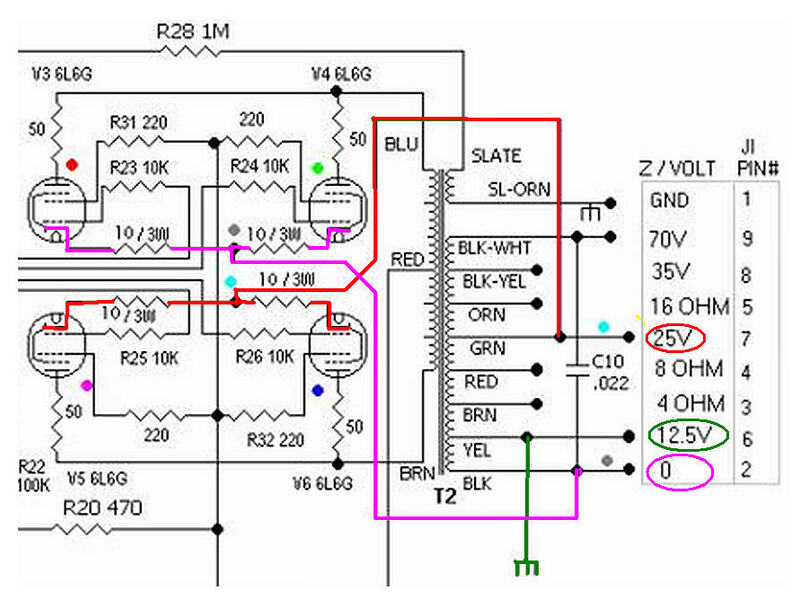 You can try to correct it via changing the value of that serial feedback resistor to a higher one. As long as the driver stage can cope with the higher voltage swing that shall be required, you should be OK and happy with the new topology, as it is a much more interesting method of achieving linearity within the output stage. One might ask: Why is the output power lower, and why do I need more voltage swing at the control grid ? I will try to give you a “visual” on that. Imagine that the 8 ohms speaker is driven from your 32 Watt amplifier. That would imply an output RMS voltage of 16V, as 8 ohms * 32 Watts = 256 V*V = 16V * 16V. The peak voltage of such an RMS would be 22,6V peak, and a peak-to-peak would be the double of that. Now, imagine that you are the Cathode of the output tube. You are riding upon the crest of the signal, and hence, you have been essentially “lifted” by that amount of instantaneous voltage (22,6V) from ground, AC wise. 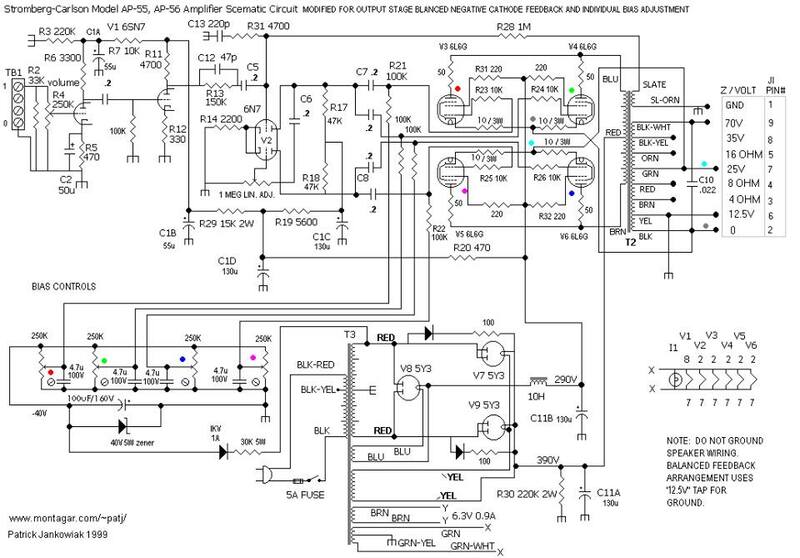 And this “lift” opposes the signal voltage (as referenced to Ground) on the Grid, effectively reducing it’s impact on the Grid (as referenced to cathode) by that very amount of 22,6V. A smaller net signal to the Grid-to-Cathode – implies a smaller output power in such conditions. 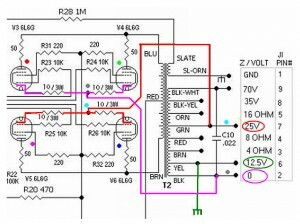 That means that the signal voltage on the Grid of the output tube would need to be higher, so as to compensate for this “lift” of the cathode, so now the signal needs to drive the grid with a voltage swing increased by at least 22,6V, related to ground. Practically, it needs to be increased yet a bit more. Happy soldering / tweaking ! ( … at do not get yourself killed, while you are at it).